Sometimes we get carried away at Super Bowl – tons of junk food with too much salt and too many preservatives and stuff. We had a smaller group this year so we kept it simple while preserving one of the great traditional values – chili con carne. 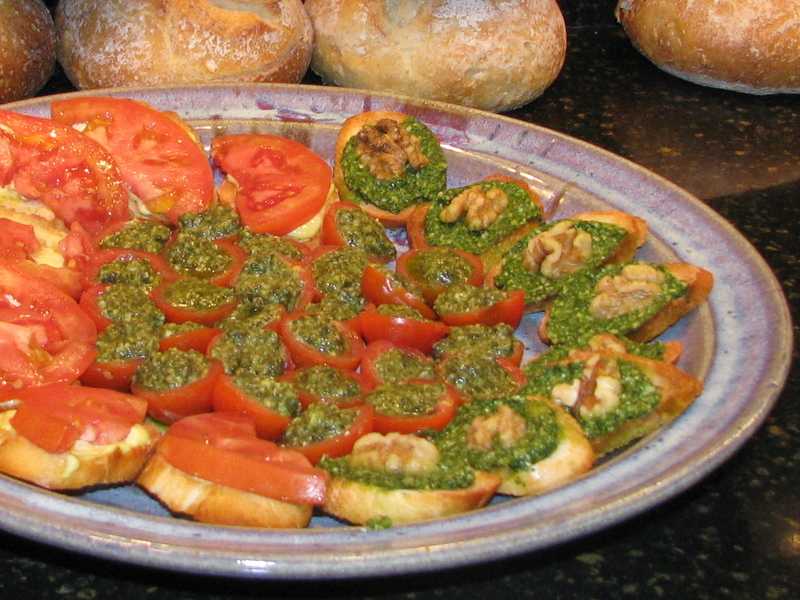 We started with the Bravado Trio of appetizers that were so healthy it was sickening – cherry tomatoes filled with basil pesto, thinly sliced tomatoes with a hint of Balsamic vinegar on crostini with homemade olive oil mayonnaise, and the now famous cilantro pesto on crostini. It makes a beautiful decorative platter that everyone gobbled up. Assuming you have been actually trying the Bravado recipes like you are supposed to do, you know that these appetizers are quick and easy to make. If you can’t remember how to make the pestos – basil and cilantro – or the crostini, click on the links above and refresh your memory. One of the revered seers of Bravado Cooking, Priscilla, made the chili. 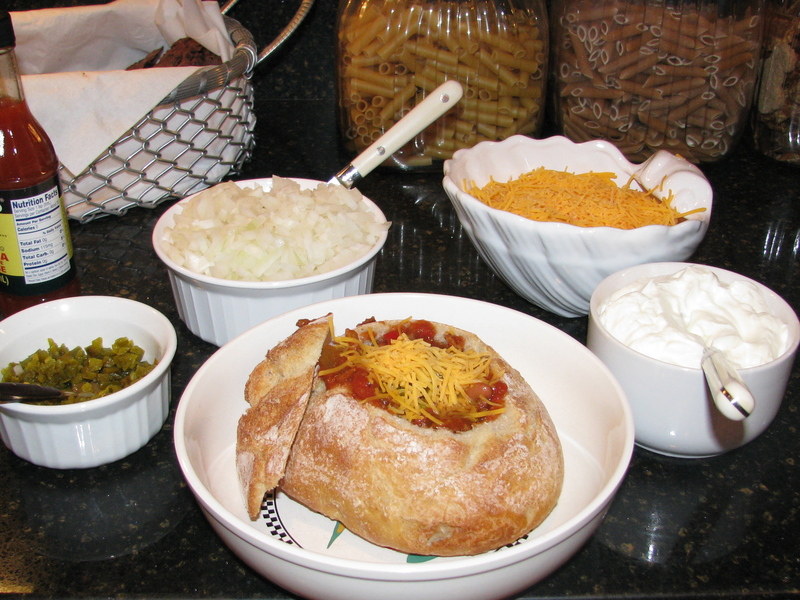 She didn’t mess with the traditional recipe – she used ground beef as the base meat, tomatoes, black beans, etc., with Jalapeños, sour cream, cheese and onions on the side. 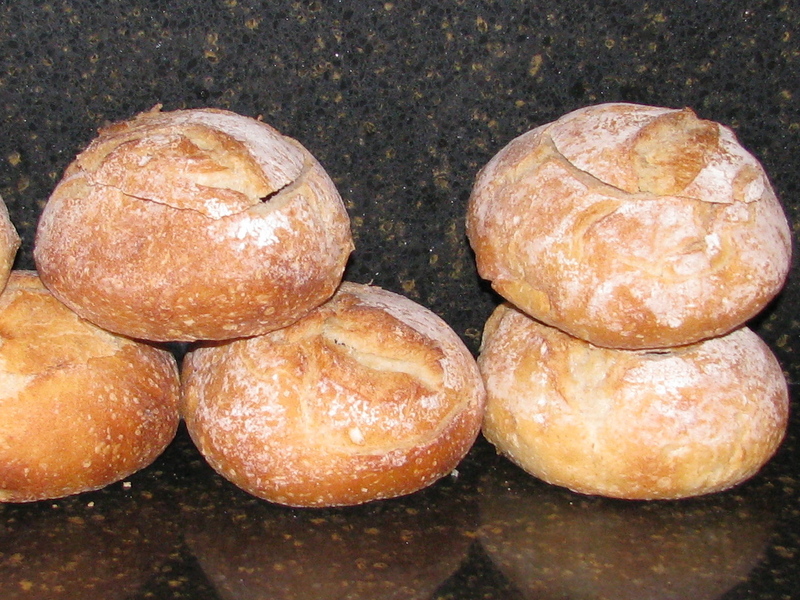 The real surprise was the whole grain bread bowls, which were used for serving. Wow, this really added some pizzazz! 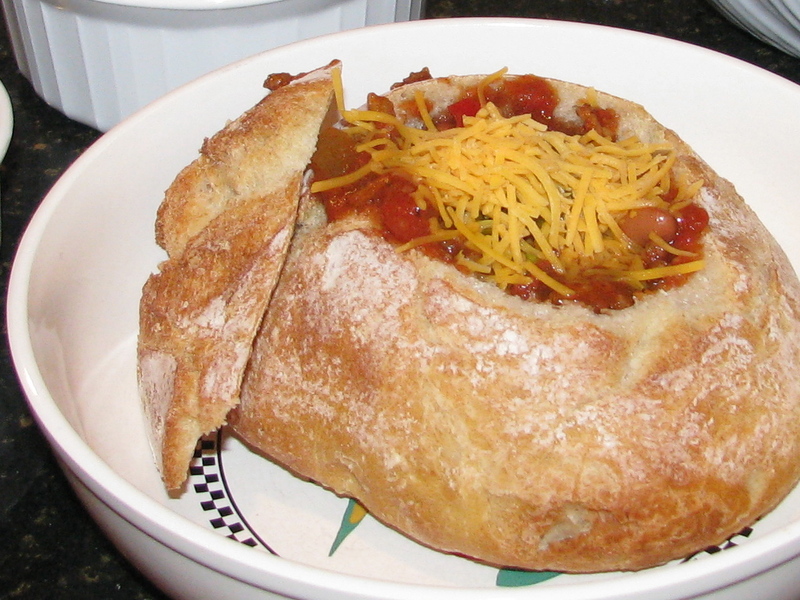 The bread on the inside slowly dissolves into the chili – especially after the third helping. She got the bread bowls from Fresh Markets, but other good bakeries should have them. She had to carefully cut the tops off and scoop the bread out of the inside, but, all in all, not very difficult and the result is very Bravado. It was a simple meal – a plate of appetizers, chili in a bread bowl and a couple of bottles of good wine. And, it was a great football game. It doesn’t get much better.